The Quarters Downtown is starting to shine! The Quarters Downtown is transforming into a vibrant urban village, next door to downtown Edmonton. It is the up-and-coming residential neighbourhood in the core of the city, offering a prime opportunity for commercial investors. 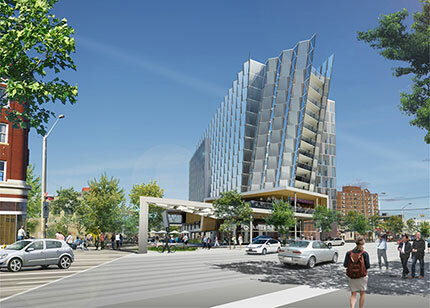 With potential for incredible residential growth and millions of dollars of public infrastructure investment, The Quarters Downtown is a fantastic opportunity for strategic, long-term investment. The Quarters Downtown is in phase one of a public investment plan, with $56 million going into infrastructure investment and public amenities. Phase two will see a further $43 million of infrastructure investments, focusing on park development, drainage and streetscape improvements, starting in 2015. The Quarters Downtown is in the heart of Edmonton, with access to transportation and public transit. Construction of the new light-rail train line that has a stop in The Quarters Downtown starts in 2016. Currently, the Quarters Downtown is home to 2,400 residents but will soon have the infrastructure capacity to accommodate up to 18,000.